About seven-in-ten (72%) expect that Democratic control of the House of Representatives will lead to a lot (21%) or some (51%) change to the way things are going in the country today. Smaller shares say the Democratic House majority will lead to not much (21%) or no change at all (6%). Expectations for change are somewhat higher than they were in November 2014. Four years ago, a telephone survey found that 58% of the public expected at least some change to the way things were going in the country, following the GOP winning control of the Senate and expanding their majority in the House. 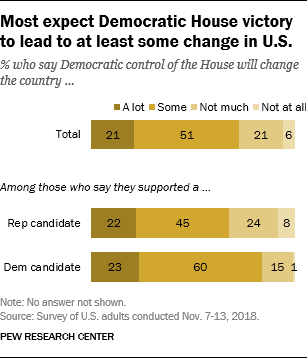 Among those who say they voted in the midterm election and supported a Democratic candidate, 84% say they expect at least some change as a result of the Democrats gaining a House majority (though just 23% expect a lot of change). Among voters who supported a Republican candidate, 67% expect at least some change to the country following the results of the midterm elections. The public has low expectations for the legislative agendas of both Donald Trump and Democratic leaders in Congress. By 63% to 35%, more say Trump will be unsuccessful than successful in getting his programs passed into law over the next two years. Opinions about whether Democratic congressional leaders will be successful are similar: 61% think they will be unsuccessful, while 36% say they will be successful. Public doubts about Democratic leaders’ chances of passing legislation are greater today than they were for Republican leaders in 2010, shortly after the GOP won a majority in the House. A telephone survey in November 2010 found that 43% thought Republican leaders in Congress would be successful getting their programs passed into law, compared with slightly fewer (37%) who thought they would be unsuccessful; 20% volunteered that they did not know if they would be successful or that they would have mixed success. 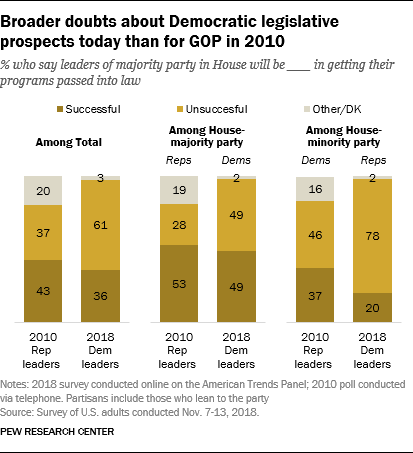 Currently, Democrats are divided over whether the new House majority will have legislative success (49% say Democrats will be successful, while as many say they will be unsuccessful). Republicans overwhelmingly say House Democrats will be unsuccessful (78% say this). After the GOP’s House victory in 2010, more Republicans said their party’s House majority would be successful than unsuccessful (53% vs. 28%). At that time, 37% of Democrats expected the GOP would be successful, while 46% said they would be unsuccessful. The public is skeptical about the future of relations between Republicans and Democrats in Washington: More than four-in-ten (44%) expect relations between the two parties to worsen in the coming year, while 46% say they will stay about the same; just 9% expect bipartisan relations to improve. This is the most pessimistic public outlook for partisan relations in midterm post-election surveys dating back to 2006. 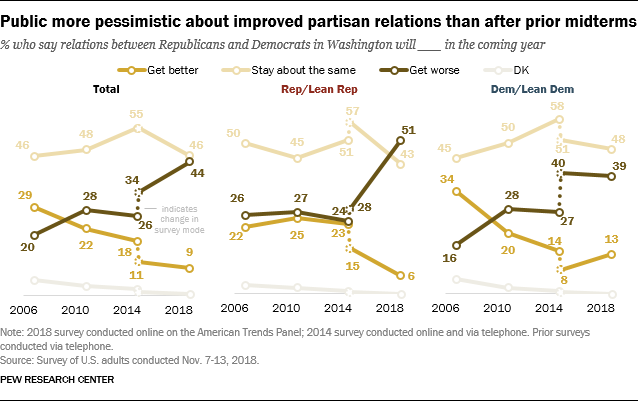 Republicans, in particular, have a negative outlook about partisan relations in the year ahead, with 51% saying relations will get worse, 43% expecting them to stay the same, and just 6% saying they will improve. Following the prior three midterms – even after 2006, when Democrats won the House and Senate – fewer than a third of Republicans expected relations to worsen. Among Democrats, predictions for bipartisan relations over the next year are little different than they were following the 2014 election: 39% expect relations to worsen, 48% expect little change, while 13% say they will improve. Who should take the lead in Washington? 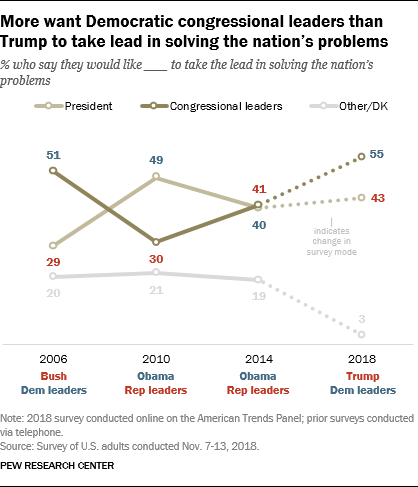 When asked whether Trump or Democratic congressional leaders should take the lead in solving the nation’s problems, 55% of Americans say Democrats, while 43% say Trump. In 2006, when Democrats gained control of both chambers of Congress for the first time in more than a decade, more said Democrats (51%), rather than George W. Bush (29%), should take the lead. Four years later, after Republicans gained control of the House, 49% said Obama should take the lead, while 30% said GOP leaders. After the previous midterm election in 2014, when the GOP regained control of the Senate and held the House, the public was split over who should take the lead (41% GOP leaders, 40% Obama). Trends from 2014 and earlier are from telephone surveys, and roughly 20% in these years volunteered another response (such as both, neither, or don’t know). The current survey has a new version of the question that asks whether Democratic leaders, Trump, or both, should take the lead in solving the nation’s problems. In this version of the question, just over half of Americans (54%) say both the president and Democratic leaders should take the lead; among the remainder, more say Democrats (28%) should take the lead than Trump (17%). In both versions of the question, Democrats are more likely to say Democratic leaders should take the lead than Republicans are to say Trump should. 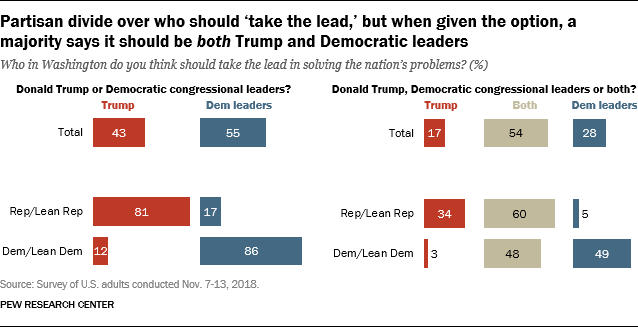 And when offered the option of saying both Trump and Democratic leaders should take the lead, more Republicans (60%) than Democrats (48%) say both sides should solve problems. Majorities want to see efforts at cooperation from Trump and Democratic leaders in Congress. But a larger majority says Trump should cooperate with Democratic leaders than says they should cooperate with Trump. Overall, 84% say that Trump should cooperate either a great deal (39%) or a fair amount (45%) with Democratic leaders in Congress over the next two years. A smaller majority (65%) says Democratic leaders should cooperate with Trump at least a fair amount. Nine-in-ten Democrats and Democratic leaners think that Trump should cooperate with congressional Democrats at least a fair amount – including 51% who say he should do a great deal to cooperate. Most Republicans and Republican leaners (77%) also favor at least some cooperation from Trump, though just 25% say he should cooperate a great deal. While Republicans support Trump cooperating with Democratic leaders in Congress, Democrats are divided over whether their congressional leaders should cooperate with Trump. 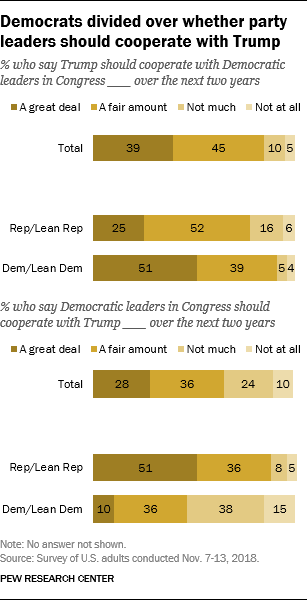 Overall, 46% of Democrats say Democratic leaders in Congress should cooperate with Trump at least a fair amount over the next two years; a slightly greater share (53%) says they should cooperate not much or not at all. A broad majority of Republicans (87%) say Democratic leaders in Congress should cooperate with Trump over the next two years. Having won a majority in the House, Democrats are divided in concerns about how congressional Democrats will investigate the Trump administration. About half of Democrats and Democratic leaners (51%) say they are more concerned that Democrats in Congress will not focus enough on investigating the Trump administration, while 46% say they are more concerned Democratic leaders will focus too much on investigations. 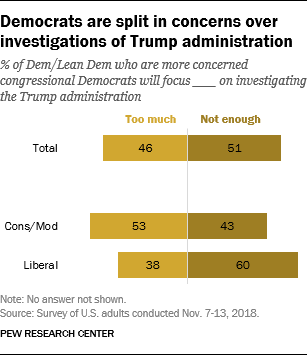 A majority of liberal Democrats (60%) say they are more concerned that Democrats in Congress will not focus enough on investigating the Trump administration; far fewer (38%) say their greater concern is that congressional Democrats will focus too much on investigations. By contrast, 53% of conservative and moderate Democrats say their greater concern is that congressional Democrats will focus too much on investigating the Trump administration; 43% say they are more concerned that Democrats in Congress will not focus enough on investigating the administration.